A stroke is a brain attack. A stroke is caused by a sudden blockage of a blood vessel supplying the brain (ischemic), or bleeding into or around the brain (hemorrhagic). Most strokes (85%) are ischemic. Stroke should be treated as a medical emergency because there is a critical time, a “therapeutic window”, which may vary from minutes to a few hours in which a stroke can be reversed or mitigated. Acute ischemic stroke can be treated with medicines to unblock the artery and with urgent surgery to unblock the artery. Both are highly time sensitive treatments. 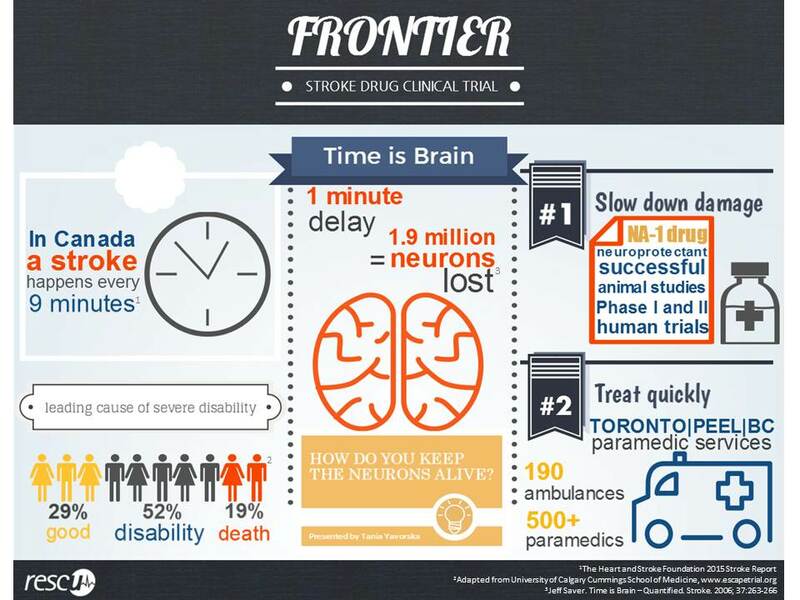 The phrase “time is brain” emphasizes that brain tissue is rapidly and irretrievably lost as stroke progresses and that early intervention is critical to improve a stroke victim’s outcome. Medicines that could slow or halt the progression of damage to the brain after a brain artery is blocked could substantially benefit patients. This what NA-1 does. NA-1 is being developed as an emergency drug aimed at reducing global disability in patients with acute cerebral ischemia if administered within three hours of symptom onset. The main goal of the study is to determine the efficacy of NA-1 in reducing global disability in patients with acute stroke. • Increasing the proportion of aborted strokes. • Improving activities of daily living. UPDATE January 2016: Trial was restricted to the Vancouver site only.